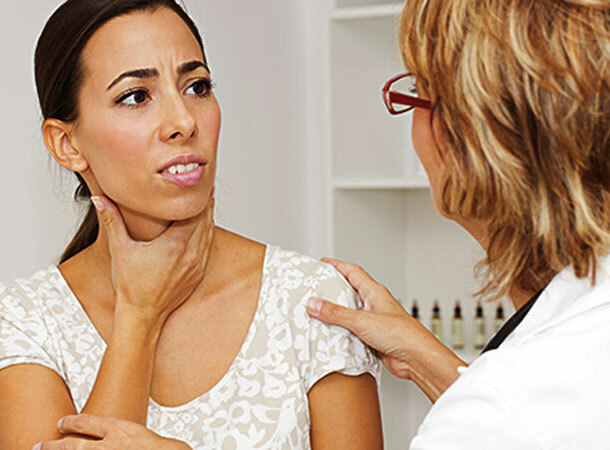 Sore throat is one symptom of an array of different medical disorders. Infections cause the majority of sore throats, and these are the sore throats that are contagious (can be passed from one person to another). Infections are caused by either viruses (such as the “flu” the “common cold” or mononucleosis) or bacteria (such as “strep”, mycoplasma or hemophilus). Most viral sore throats accompany the “flu” or a “cold:’ When a stuffy-runny nose, sneezing, and generalized aches and pains accompany the sore throat, it is probably caused by one of the hundreds of known viruses. These are highly contagious and cause epidemics in a community, especially in the winter. The body cures itself of a viral infection by building antibodies that destroy the virus, a process that takes about a week. “Strep throat” is an infection caused by a particular strain of streptococcus bacteria. This infection can also cause damage to the heart valves (rheumatic fever) and kidneys (nephritis). Streptococcal infections can also cause scarlet fever, tonsillitis, pneumonia, sinusitis and ear infections. Hayfever and allergy sufferers can get an irritated throat during an allergy attack the same way they get a stuffy, itchy nose, sneezing and post nasal drip. The same pollens and molds that irritate the nose when they are inhaled also may irritate the throat. People allergic to cat and dog danders can suffer an irritated throat when they are around such animals. A very common allergy is house dust, and it is a special problem in the winter when a heating system blows dust throughout the house. During the cold winter months, dry heat may create a recurring, mild sore throat with a parched feeling, especially in the mornings. This often responds to humidification of bedroom air and increased liquid intake. Patients with a chronic stuffy nose, causing mouth breathing, also suffer with a dry throat. They need examination and treatment of the nose. Tumors of the throat, tongue and larynx (voice box) are usually (but not always) associated with long time use of tobacco and alcohol. Sore throat and difficult swallowing-sometimes with pain radiating to the ear – may be symptoms of such a tumor. More often the sore throat is so mild or so chronic that it is hardly noticed. Other important symptoms include hoarseness, a lump in the neck, unexplained weight loss and/or spitting up blood in the saliva or phlegm. a. Not treating is an option as many throat infections are mild and soon get better without treatment. b. Have enough to drink to avoid lack of fluid in the body (dehydration). It is tempting not to drink very much if it is painful to swallow. You may become mildly dehydrated if you don’t drink much, particularly if you also have a high temperature (fever). Mild dehydration can make headaches and tiredness much worse. c. Paracetamol or ibuprofen ease pain, headache and fever. To keep symptoms to a minimum it is best to take a dose at regular intervals, as recommended on the packet of medication, rather than now and then. For example, take paracetamol four times a day until symptoms ease. If necessary, you can alternate and take both. Note: some people with certain conditions may not be able to take ibuprofen, so always read the packet label. It is very important not to take more than the dose advised on the packet. d. Lozenges can be bought in pharmacies or supermarkets. Some people find these helpful to soothe a sore throat. You may also find sucking boiled sweets, ice and ice lollies can be soothing. e. Other gargles and sprays can be bought at pharmacies to help to soothe a sore throat. However, there is not very much evidence about how effective they are and they do not shorten the illness.